In this fourth Owl novel, Kristi Charish melds sparkling fantasy with the grit of urban underbelly—with a detour through the world’s most spectacular cities. Through no fault of her own, Alix has found herself essential to the fate of the world as we know it. Years ago, Owl reluctantly entered the secret world of the supernatural. Her goals: complete one job, escape one bounty on her head, continue her thieving in peace. Fast forward to today. Now, she has become a key player in a brutal paranormal civil war that is rapidly getting out of hand. The leader of one of these factions—a lethal opponent called the Electric Samurai—grows more powerful by the second. 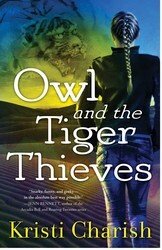 To stop him, Owl sets out to find the long-lost, legendary group known as the Tiger Thieves. But will it be too little too late?